Is Low Fat Eggnog An Oxymoron? 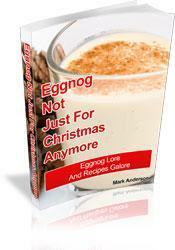 I adapted this low fat eggnog recipe from another recipe that claimed to be low on fat. However, it was far too sweet. The sugar needed to be cut way down, so I did that. (Since when does white sugar contribute to “low fat”?) Then I increased by 25% the amount of milk in order to reduce the calories per serving even further. To me it’s still plenty sweet and definitely delectable. Want to Egg-spand your culinary pleasure? "Eggnog—Not Just For Christmas Anymore!" will eggs-ceed your egg-spectations! Eggnog lore, recipes galore. Buy Ebook Now for Only $9.95! Combine sugar, cinnamon and nutmeg in a large mixing bowl. Add pasture-raised egg and egg whites. Beat all with a mixer for about 3 or 4 minutes. On low to medium, heat the milk in a large saucepan. Slowly stir egg mixture into the heated milk. Stir constantly as you heat the mixture until slightly thickened. Add vanilla and stir. Remove from heat. Cool slightly, and then add half-and-half milk. It’s luscious warm. Or cover and chill in fridge. Sprinkle a dash of nutmeg for garnish on top.